Overcoming adversity can make or break a new team. 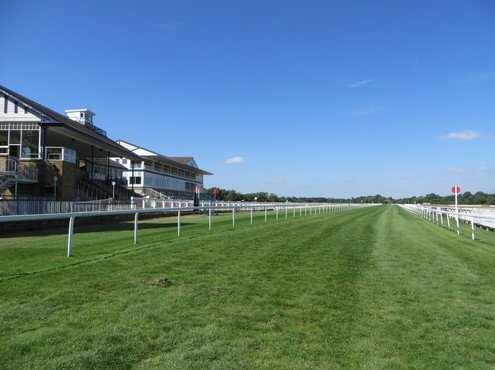 When Royal Windsor Racecourse had to abandon a meeting in May 2017 after horses slipped on the far bend, a repeat of an incident the previous year, it was clear that change was needed. Jane Carley meets the young team who are putting things right. Ed Arkell, now Clerk at Goodwood, initially stepped in, before ARC Regional Clerk Charlie Moore oversaw the first phase of renovation. 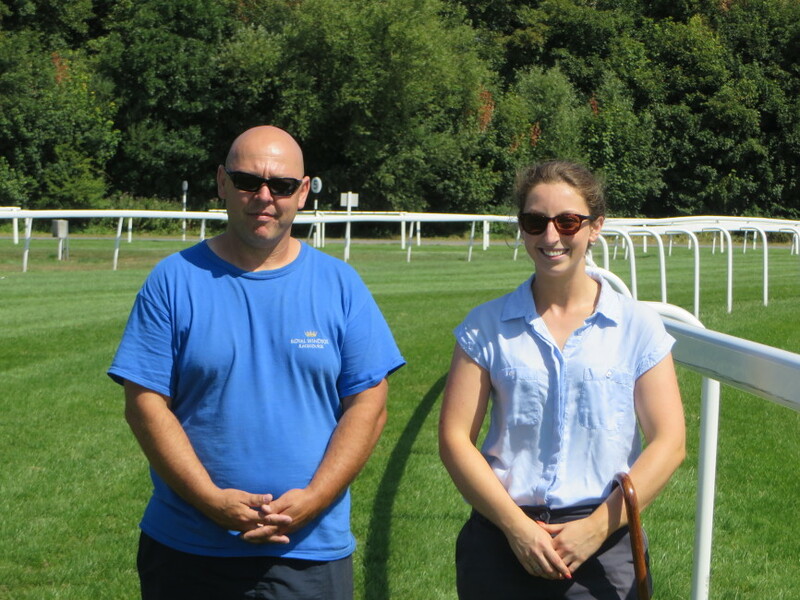 Eloise Quayle was appointed in October as Trainee Clerk of the Course, with former assistant head groundsman Dan Halffman as head groundsman, and their fresh approach has transformed the Berkshire course. 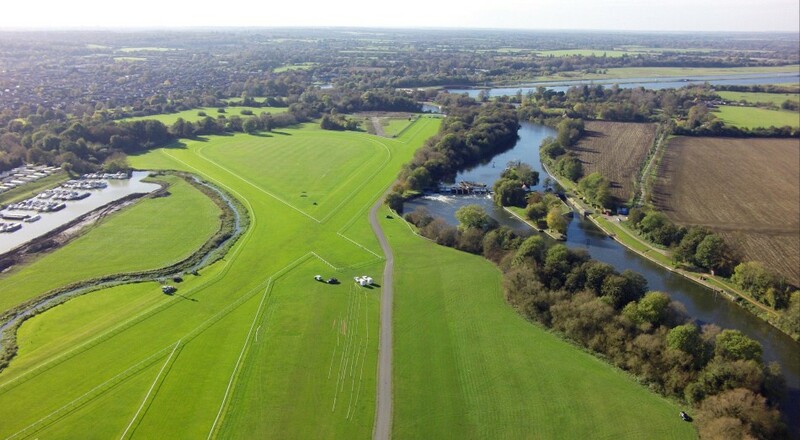 Built on what is effectively an island in the Thames 153 years ago, Windsor has raced under both codes in the past, but now holds twenty-seven turf flat meetings from mid-April to October on its unique figure of eight track, including a fixture every Monday from April to September. The highlight of the season is a three-day festival in July, but the grounds team are kept busy year-round, with conference and events bookings using the public areas in and out of season. Race nights are often accompanied by concerts or themed activities and this provides an additional bonus even for the equine participants. "Trainers like to bring young horses here to get them used to a buzzy atmosphere. But equally, it's a fair, flat track with good going, so an ideal preparation for horses that are going on to the big meetings such as Royal Ascot," explains Eloise. The silty clay soil is variable, with some areas drying quicker than others, and soil analysis has revealed cation exchange indicating how well it holds nutrients. So what went wrong? "The previous regime was very traditional," explains Dan. "After racing, the surface would be mowed, rolled and then watered, but the water could not penetrate the surface and sat on top. It was rarely harrowed or slit. 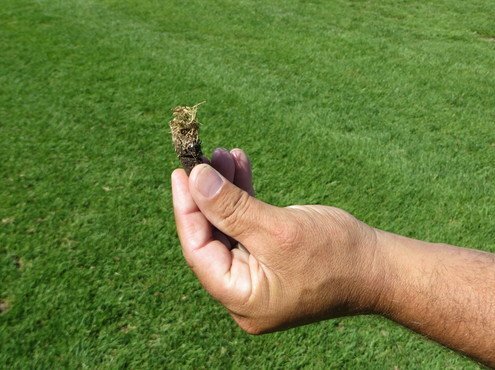 There was a lot of lateral growth and insufficient rooting, and even Verti-Draining didn't help as it simply pulled the turf up." An early task was to address the running lines to help ensure that horses ran straight and didn't become unbalanced. Charlie Moore worked with Eloise and Dan to realign the rail on the bend and on the pull-up area after the finish, another cause for concern. These running lines were mapped with GPS and rails realigned accordingly. "Because of the way that horses see, unless you guide them around a bend with the rail they will tend to run straight and drift outwards, making a turn at the last minute or losing their action," explains Eloise." "As the course is a figure of eight, rail movements on the straight also affect the bends, so we have to think of the course as a whole. 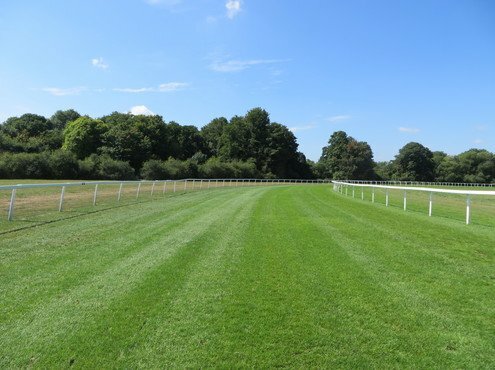 I've also narrowed the straight as the season has progressed to take the horses away from the dryer ground next to the tarmac enclosure, and it's interesting how the runners are now using the whole width rather than hugging the inside rail." Turf on the bend was cut right back, and a programme of aeration and topdressing put in place. 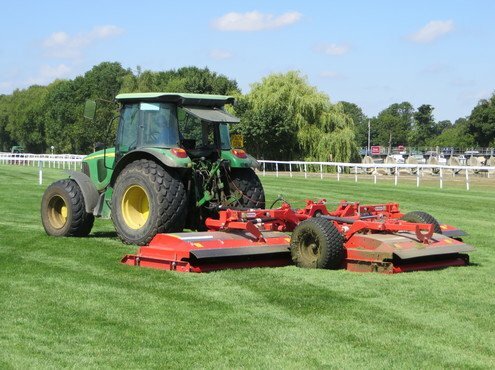 "We mowed it with a ride-on as the grass re-established, and used a drum corer to aerate, a machine we have continued to use after every meeting. We have seen improved root penetration which is reflected in the strong grass growth," says Dan. Racing once a week, there is ongoing pressure to not only produce a surface that is not only safe but also consistent throughout the season, week after week. Eloise admits that she has had to rebuild jockeys' confidence in the track. "They wanted to walk it and have a look at the ground, but once you get one respected jockey saying that it has improved, the others tend to follow suit. You can see that they have got their confidence back from the way they ride, rather than holding horses up to ensure that they don't get unbalanced, they will ride competitively round the bend now." Rather than putting all the water on in one pass, it is now applied in two passes, the first the day after racing and the second over the weekend before the following meeting. "We start with the straight as this is used in all of the races, so gets the most wear," she explains. A tow line system is used, powered by an old diesel pump, with water extracted from a branch of the Thames. "We're looking at using a Briggs boom, which would also give us the option to water at night," comments Dan. "The ideal solution would be to combine the two and use the tow line on the bends, although this year's weather conditions are unprecedented and we wouldn't need to water this much normally." With just 1.8mm of rain in June, and 0.2mm in the first three weeks of July, effective irrigation has been vital this year. "In addition to the heat, the course is quite breezy, so we lose 6mm/day in evapo-transpiration," comments Eloise. "We've been putting 48mm on each time, which takes six hours to apply." The course is slit weekly to help irrigation penetrate and then scarified with an Opico grass harrow once a fortnight. "We'd like to use a Verti-Drain to aerate but don't have one in the fleet currently, although we can hire in for seasonal use." "We plan to test a small area with the Verti-Drain prior to doing more extensive work this September, as we believe there is now enough root development to benefit from it," says Dan. Reviewing turf nutrition was the final piece of the jigsaw. "We started with a granular formulation of the root stimulant Activate R and then moved onto the liquid feed version, with such good results that we now treat the whole track with it." The plan this summer was to give a split feed of 12:4:8 slow release fertiliser in April and August, but the sward has done so well in the conditions the second application is on hold. Mowing can be required twice a week in the peak growing season, although one benefit of the hot summer has been that the park areas have needed less attention, freeing up time needed for watering. Grasscutting equipment has also had a rethink. "We previously used a front mounted roller mower with a blower on the back to spread the clippings, and it could take 7-8 hours to cut the whole track," explains Dan. "In July 2017, we purchased an 18ft cut Trimax Pegasus, and it can now be done in two-and-a-half hours for a quick cut or four hours for a presentation cut. The quality is so much better due to the high blade tip speed, and the clippings are evenly dispersed so there is no need to use a blower." The mower is handled by a John Deere 5720 or, for the park areas, a larger 6000 series, two of four tractors used for the full range of jobs and maintained on a service contract. Eloise adds: "We have kept the grass a bit longer this summer, cutting down to 4in rather than the usual 3-3.5in to help it cope with the conditions, whilst the extra length also helps resist damage. 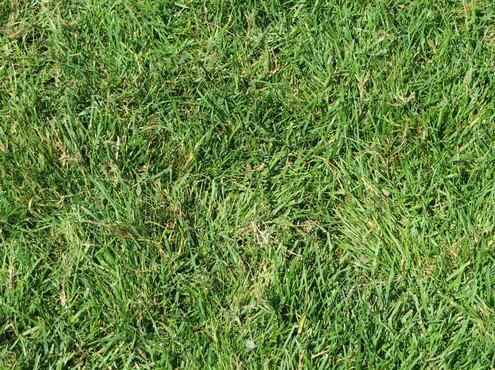 As the grass is healthier now, it stands up better even with the higher cut." Other improvements have included removing a laurel tree from the winners' enclosure to create more space and returfing the area. "It was very tight in the 4th placed horse space and could be claustrophobic with potential safety issues," says Dan. "Removing the tree has also improved airflow and helped with grass growth." 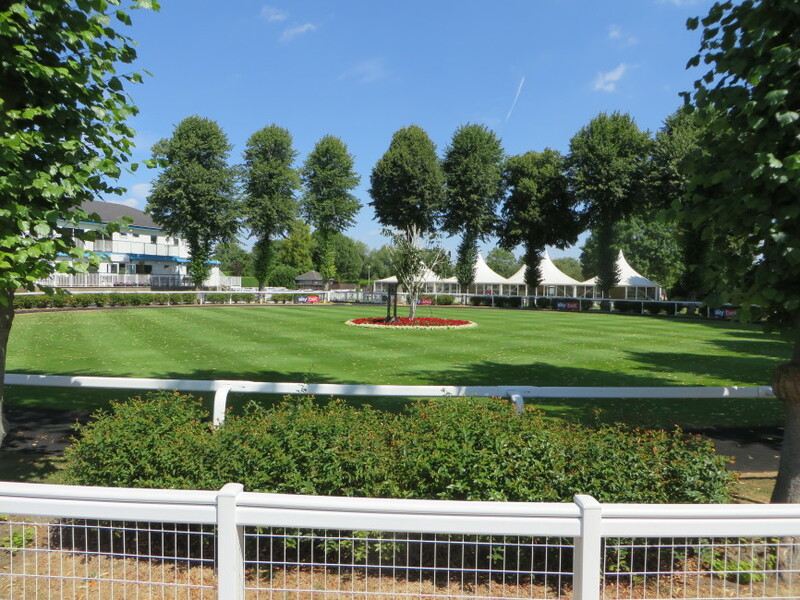 Maintenance of the public areas has also had a rethink, with the parade ring mowed and prepared immediately ahead of racing to look its best and deal with leaf fall from the many trees in this picturesque area. Many racegoers arrive from Windsor via the river, and clearing and tidying the jetty area - even planting flowers in an old boat - has improved their experience. 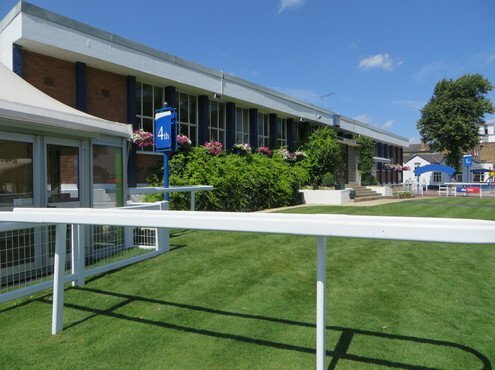 Conferences and events take their toll on the public areas and, whilst the parade ring and saddling areas have been kept green, Dan and the team have fought a losing battle with the lawns in this driest of summers. "We have to turn the sprinklers off if there is an event on, and resurfaced inside the lawn marquee with woodchip after the grass died. It's all part of the job, but can be a bit disheartening." "On the upside, visitors who come to the course for an event often return for a day's racing, and the Monday evening fixtures are an attractive proposition for businesses," says Eloise. Non-racing activities have also provided some unusual benefits - the course was used for parking during the 2012 Olympics when nearby Dorney Lake hosted the rowing. A new perimeter hard road was constructed which is now used as the service road for emergency vehicles during racing! Tourism in the area is also driving developments with a proposed hotel development in the little-used Silver Ring area. One event which Dan remembers with mixed feelings is Saltex, held on the racecourse until its move to the NEC in 2016. "Whilst it was brilliant to have the whole industry here, it did make a lot of work," he recalls. "One of the biggest tasks was to renovate the areas where trackway was laid to allow vehicles to cross the course, ahead of our final meetings in October. We had to reseed and cover it with plastic to get grass to grow back in the space of a week!" 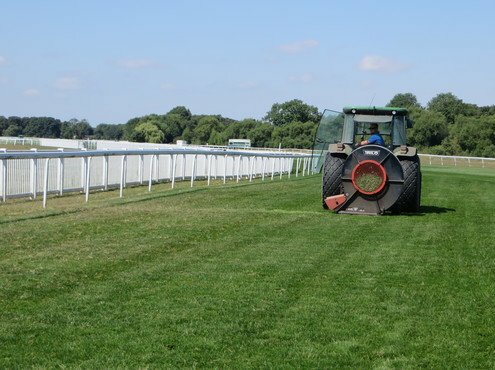 Racecourse groundsmen have the added task of helping with horse welfare in hot weather, providing and often applying buckets and buckets of water to overheated equines. "We normally have one groundsman stationed in the winners' enclosure to help cool down horses, but this summer we've had two," explains Eloise. "Both are interested in horses, so can quickly spot if a runner is in distress. We had one horse overheat in July, and it was wonderful how well everyone responded to help it - even the medics were ferrying water! The horse recovered quickly and it was a real team effort." With just four groundsmen in the team, they are often at full stretch, and Dan comments that the winter ahead will provide an opportunity to consider how best to use their resources. "It's a young team - two of the lads hadn't even driven a tractor before they came to Windsor and we will certainly do some more training, and we'd like to be more flexible about who does what," he says. "The difficulty is that some roles just work so well," says Eloise. "Dan and his assistant Steve have the irrigation down to a 't'." The working relationship between the two of them has strengthened and developed through the challenges and both bring different skills to the job. Dan is from a greenkeeping background, latterly helping with the redevelopment of Royal Ascot Golf Course after it moved away from the racecourse. Eloise has a degree in biology and worked as travelling head lass to trainer Ben Pauling before applying to train as a Clerk of the Course, receiving her accreditation in May this year. "We can bounce ideas off each other and have healthy discussions," says Eloise. "But communication is key - Dan will always tell me exactly what he has done and then it's so much easier to justify actions to trainers who enquire why we have prepared the course in a particular way." 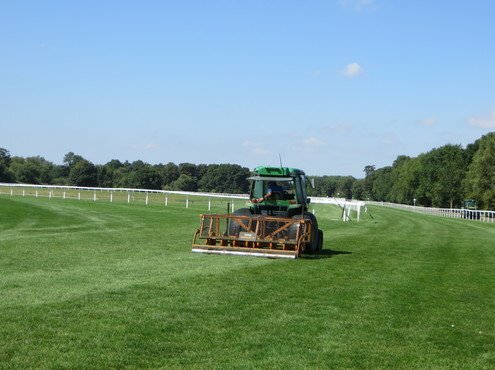 "It means a lot to us to get the racing surface as good as possible and keep it that way, and to rebuild the reputation of Royal Windsor Racecourse," says Dan. "It's hard work racing every Monday but there's a great adrenalin rush and I think the whole team enjoy it."